For a comedic actress and writer as prolific as Tina Fey it's sort of shocking that she's never starred in a smash hit film. Her commitments to television are a big reason for this, but someone as funny as her should've been given the keys to a comedy franchise at this point. 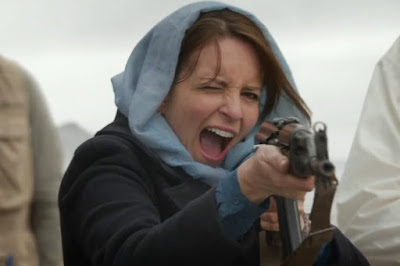 Whiskey Tango Foxtrot marks a slight shift on Fey's film resume. Directors Glenn Ficarra and John Requa plant Fey's comic sensibility in a journalistic war film that's a tonal balancing act jumping through different genres. Fey is Kim Baker, a nowhere USA news producer in 2004 whose luck changes when a foreign correspondent position opens up in Afghanistan. Her arrival in the battleground looks like a deleted scene from Zero Dark Thirty and then a local calls her a “shameless whore”, which is Whiskey Tango Foxtrot's tonal balance in a nutshell. It's a mid life crisis rom com set in a war zone but with western comedic convention and the little tension found in it's harsh location is overwhelmed by gags. The laughs it does land come from expected places in a studio comedy but with a slight genre twist because of Kim's unfamiliarity. The unfairly talented Margot Robbie plays Tanya, another western reporter staying in Kim's quarters. Upon meeting Kim she observes "In New York, you're like a six, seven? Here, you're a nine, borderline 10." It's one of the few moments in the film that applies western culture to the eastern location for insightful comedic effect. Martin Freeman as a rude British photographer gives a playful performance although his character is too easily telegraphed as a love interest and is there solely to please the romantic comedy audience. Billy Bob Thornton as the tough but cool General Hollanek is a great bit of casting. Then there's Alfred Molina going over the top as Afghan Attorney General Ali Massoud Sadiq, and with all the talk of diversity it seems slightly #problematic to have a white guy playing ethnic in a film about a white women broadening her world. We've seen the dimwitted foreigner and we've seen plenty of modern war films and raunchy comedies fill up multiplexes, but I can't recall a recent film trying to glue them together. This makes Whiskey Tango Foxtrot an almost experimental tonal film that's consistently juggling and dropping it's different gears. If this were a more serious film it would've explored Kim being a successful independent woman in a society that represses females. But Robert Carlock's script skims through its themes and hops into different genres looking for the nearest gag and ignoring thematic substance. Yet, there's something refreshing about a film making silly jokes and then leaping into a dangerous shootout. But this isn’t MASH and Robert Altman certainly does not direct it. It's almost unfair to fault a film as a tonal mess when it's trying be so many different things but I never got the sense that it committed to saying anything worthwhile about it's subject. At best it's a fish out of water film about living in a dangerous location as a reporter and the funny social quirks of that lifestyle. The social rules of the reporters and photographers are the most intriguing aspect as well a few performances. For a film whose first letters spell WTF it could've use some more WTFing to break free of it's crowd pleasing formula. A film taking place in a country so dangerous and full of intricate conflicts should try to do more than simplify the complexities for broad humor appeal. 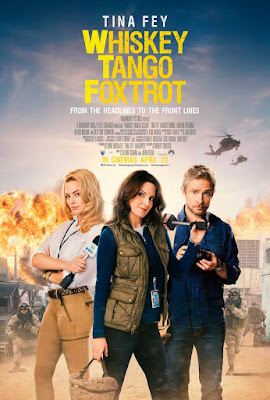 Whiskey Tango Foxtrot touches on fascinating themes and ideas but quickly detours into either romantic conventions or silly gags. There's little weight here, which gives us little reason to care.